"Put down the mouse and shop near your house!" We sell New & Used books. We will make recommendations especially for your taste. Books & Journals that are fresh and unique. Distinctive greeting cards, puzzles & Maine-Made gift items in a family-owned store. Please feel free to browse the new & used books on our shelves. We are glad to order books - these come very quickly. Your gift books can be mailed directly. A very fine history of these indomitable women whose courage & persistence helped to win WWII in the European theater. Enjoy these very personal, eye-opening accounts of brave women whom nobody suspected of spying, let alone leadership of the largest Resistance group in France. Marie-Madeleine trained spys, kept them supplied, orchestrated data gathering, and then got that invaluable information to Churchill and Eisenhower to enable invasions, to protect Allied troops and to win the European battles and help defeat Hitler. Beautifully written – Owens brings the marsh to life on the pages as we get to know Kya, the isolated “Marsh Girl” who lost, one by one, all of her family and then the young man who taught her to read and whom she grew to love. The monsters in this story are the human predators. But Kya has kind-hearted friends who help her in so many ways. Magnificent! These 800 pages are all needed for Sansom to tell the story fully. It's another fascinating pageturner. The historical notes are an added bonus. A new CJ Sansom novel is always worth the wait. His writing and research are excellent, as are his characters and choice of historical events. You are transported to Tudor England. I've always enjoyed that he doesn't focus solely on the nobility, but gives us a glimpse of all levels of Tudor society. The Iliad, Gareth Hinds adapts Homer’s classic wartime epic. 3000 years ago, two armies fought an epic battle that came to be known as the Trojan War. Homer’s legendary account of this 9-year ordeal, is considered the greatest war story of all time. In this stunning graphic novel — renowned illustrator Gareth Hinds captures all the grim glory of Homer’s epic. Dynamic illustrations take us to the plains of Troy, into battle, and bare the complex emotions of the men, women, and gods whose struggles fueled the war. 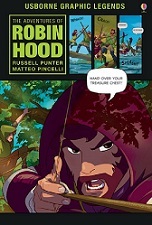 This volume has notes, maps, and a cast of characters to help readers understand all the action and drama of the tale. England 1194: The poor folk of Nottingham find themselves at the mercy of the heartless money-grabbing Sheriff. But deep in Sherwood Forest, rebellion is brewing. Join brave Robin Hood and his band of daring friends as they pit their wits against the Sheriff and his ruthless ally, Guy of Gisbourne. Swashbuckling thrills come thick and fast in this adventure story. These new graphic novels provide a gateway to somewhat difficult stories for reluctant readers to learn to enjoy. Specifically designed to be easily readable, with familiar vocabulary and sentence structure, these stories are entertaining with fun, action-packed illustrations sweeping us into an imaginary universe. It's hard to make an honest living in a land brimming with magic & mystery, and treasure hunter Luvander is tired of being a penniless adventurer. Ever in search of gold and glory, she sets off for a fabled dungeon "the Dragon's Maw", an ancient tomb at the bottom of which slumber endless wealth or certain doom! Luvander teams up with a team of scraggly hunters, each seeking treasure. Prince Aki, of the Scarlet Sands Empire, anxious yet blind to the consequences. His royal Shadow and bodyguard, Koro, whose very honor hangs in the balance of her prince's success. And Dorma Iron, a stocky young dwarf whose journey will take her deeper into darkness than she ever wished to tread. For these scruffy heroes, what starts out as a road to riches becomes the first step on a journey to destiny, for Luvander holds a secret that will bring light to a world encroached upon by an ancient darkness. A sinister drive-through threatens to end the world, and 3 kids in a beat-up truck are humanity's only hope! The school theater troupe is working late and Sid makes a fast trip to get tacos. But strange things are happening: the world is not quite right. The food is moving; cars, buildings and people are behaving weirdly. They have to use their wits to save the day. This is magical, bewitching storytelling...high prose expressed with rare clarity with a kind of moral dreaminess… a powerful novel about the wrenching disappearance of 3 little girls and the wide-reaching effect it has on their small town. On a dark midwinter’s night in an ancient inn on the river Thames, an extraordinary event takes place. The regulars are telling stories when the door bursts open on a grievously wounded stranger. In his arms is the lifeless body of a small child. Hours later, the girl stirs, takes a breath and returns to life. Is it a miracle? Is it magic? Or can science give an explanation? These questions have many answers, some of them quite dark indeed. Maud is an irascible 88-year-old Swedish woman with no family, no friends, and…no qualms about murder. These funny, irreverent short stories will keep you laughing all the way to the retirement home. Ever since her father’s death when she was 18, Maud has lived in the family’s spacious apartment rent-free, thanks to a contract loophole. That was how Maud learned that good things can come from tragedy. Now Maud contents herself with traveling the world and surfing the net from the comfort of her father’s ancient armchair. It’s a solitary existence and she likes it that way. Over the course of her adventures, this bold lady will handle a crisis with a celebrity who has her eyes on Maud’s apartment, foil the engagement of her long-ago lover, and dispose of some pesky neighbors. But when the local authorities find a dead body in Maud’s apartment, will she finally become a suspect? Excellent Hitchcockian storyline with surprising character development. We should introduce Allyson to Jack Reacher - they would make a terrific pair! In the small community of Owl Creek, Maine, Maggie Carpenter learns her only child is presumed dead. But authorities have not recovered her body—giving Maggie a shred of hope. She, too, harbors a shameful secret: she hasn’t communicated with her daughter in two years, since a family tragedy drove Allison away. Maggie doesn’t know anything about her daughter’s life now—not even that she was engaged to wealthy pharmaceutical CEO Ben Gardner, or why she was on a private plane. When her fiancé's private plane crashes in the Colorado Rockies, Allison Carpenter miraculously survives. But the fight for her life is just beginning. Allison has been living with a terrible secret, a shocking truth that powerful men will kill to keep buried. If they know she's alive, they will come for her. London, 1947: Besieged by the harshest winter, onerous shortages and rationing, the people of postwar Britain are enduring lives of quiet desperation despite the recent victory. Ann Hughes and Miriam Dassin are embroiderers at the famed Mayfair fashion house of Norman Hartnell. Together they forge an unlikely friendship, and due to their skill with intricate stitching and beadwork, are chosen for a singular honor: taking part in the creation of Princess Elizabeth’s elegant wedding gown. Toronto, 2016: Heather Mackenzie seeks to unravel the mystery of a set of embroidered flowers, a legacy from her grandmother. How did her beloved Nan, a woman who never spoke of her old life in Britain, come to possess the priceless samples that so closely resemble the motifs on the stunning gown worn by the Queen seventy years before? And what was her Nan’s connection to the celebrated textile artist and holocaust survivor, Miriam Dassin? This 3rd book by retired Detective Sergeant Coffin, is a powerful good read. The story takes place here in Portland, with engrossing detail on the police investigation, uncovering layers of crime: robbery, drug dealing, and the shooting of a teenage basketball star. When an attempt is made on life of the police officer who shot him, Byron shifts into overdrive. Was the attack merely retribution or something more sinister? Stir in the twisted political issues and you have a recipe for intrigue! A govt office worker who lost his wife. An ER nurse whose husband died. A little girl who sees magic everywhere. This is a tale of love and loss. It’s funny, spiritual and thoroughly enchanting. Just what we need in these turbulent times. Compare to AJ Fikery and A Man Called Ove. Thanks again for your enthusiastic welcome. Every day our customers tell us they prefer to BUY LOCAL so thank you for supporting your neighborhood bookstore. Word of mouth recommendations for Letterpress helps us to expand and continue to serve your community. Letterpress Books is family owned, a member of the American Booksellers Assoc., & Portland Buy Local.